The Nave of the church is the oldest surviving structure and probably dates from the first half of the 12th century (between AD1100 - 1150 ). There are no definite architectural features that can establish this date for certain; however, the wall between the Tower and Nave is 3' 6" thick. Such thick walls are a characteristic of Norman work, and when this is combined with the general dimensions of the Nave, a mid-12th century date of construction would seem fairly certain. 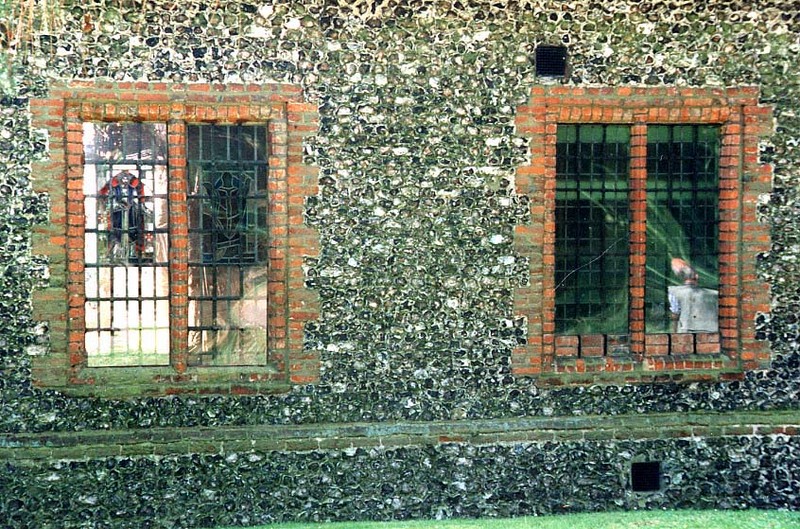 The walls of the Nave are constructed externally of knapped flint work, much of which is probably a later re-facing. Externally the walls are thickened by a plinth that is topped by a moulded string course, and dates from the 16th or 17th century. 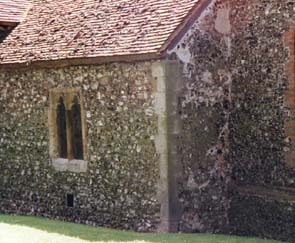 Internally, at low level, the South wall is constructed of roughly squared blocks of Kentish Ragstone. This is surprising as the material would have to have been brought some distance, and thus would have required sponsorship by an individual with money. The body of the nave possesses six large rectangular windows that date from two architectural periods. The South wall has suffered over the centuries from structural movement. The top of the wall leans outwards by some two feet, and this movement may have weakened the roof structure contributing to the roof's collapse in the great storm of 1639. To counteract this problem, external buttresses were added. These buttresses, which are constructed mainly of flint with brick tabling and dressing, have not totally eradicated the problem because one of the buttresses was fitted with a tie rod at some point, possibly in the 18th century. Recent conservation work on the buttresses also suggests that the rebuilding of 1641 may encapsulate earlier medieval work. The four windows in the South wall of the Nave are of the same dimensions as those in the North wall, and until the 1890s were identical. By the 1880s, the condition of these windows gave considerable cause for concern, and an entry in the Churchwardens' log book of 18 July 1895 records that the windows were rebuilt in their present form. The two windows in the North wall of the Nave date from the 16th century. They are formed of two equal lights divided by a slender moulded brick mullion. The moulded brickwork continues around the head, jamb, and cill of each light, and the windows are framed by matching brick quoins. The most westerly of the windows still retains the original ferramenta. Adjoining the North elevation is a lean-to structure known locally as the North Aisle, and is later than the body of the Nave. This extension to the church dates from the 14th century and retains a finely carved two light window in the decorated style of architecture. nternally the upper parts of the jambs are constructed of chalk blocks, a material used on occasions in the medieval period. The exterior of this wall shows fragments of the original rendering. 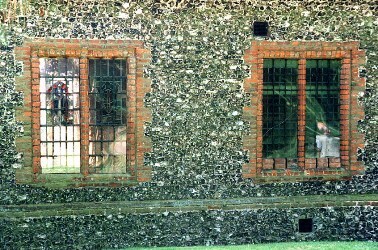 In medieval times many churches were externally rendered to hide the irregular flint work and to give a more uniform appearance. The original purpose of the North Aisle is not known. The existing broad opening into the Nave that was created in the 1880s, replaced a far smaller one described as a low arch. Suggestions for its role have included an anchorate. However, the most likely explanation is that it was a side chapel constructed for a local family for prayer or as a chantry.